The Customize Windows > Computer and Internet > Hardware > Which Microcontrollers Can Be Programmed? Which Microcontrollers Can Be Programmed? Peoples Often Ask How to Program a Micrrocontroller or IC. In This Article We Have Explained Which Microcontrollers Can Be Programmed and Their Proper Naming Convention. We will not talk about all the ways of programming a PIC Microcontroller in this article but first do an introduction. Which Microcontrollers Can Be Programmed? All Microcontrollers Can Be Programmed? Previously, we talked about the Microcontrollers. We can program the Programmable Intelligent Computer (PIC) or Peripheral Interface Controller (PIC) nor really the microcontrollers. PIC is a general purpose microcontroller that can come with many options at reasonable price. So, you can not really program all the microcontrollers. PIC is a family of modified Harvard architecture microcontroller. The early models of PIC had read-only memory (ROM) or field-programmable EPROM for program storage. All the current models of PIC microcontrollers use Flash memory for program storage. Program memory and data memory are separated. Data memory is 8-bit, 16-bit and 32-bit wide. Program instructions in bit-count vary , may be 12, 14, 16, or 24 bits long. The hardware capabilities of PIC devices range from 8-pin DIP chips up to 100-pin SMD chips. They have discrete I/O pins, ADC and DAC modules, communications ports. Can You Give an Easy List of Which Microcontrollers Can Be Programmed? Definitely. If you have less to do with Embedded systems as student, you can actually use Arduino. Arduino is ready to use. Apart from that, theoritically speaking, PICmicro chips are designed with a Harvard architecture. The baseline families use 8-bit wide data memory, whereas the high-end families use 16-bit data memory. Even 32-bit MIPS-based microcontroller is available. Instruction words are in sizes of 12-bit (PIC10 and PIC12), 14-bit (PIC16) and 24-bit (PIC24). The above has clones like ELAN Microelectronics Corp., Holtek, Parallax (discontinued models) produce a series of PICmicro-like microcontrollers. 8 bit PIC : PIC10, PIC12, PIC16, PIC18 are series of 8bit MCU. 32 bit PIC : PIC32 is the series of 32 bit MCU. A common PIC microcontroller is PIC18f452. For them, PIC Project Boards are available as ready to make development board. A PIC Project Board for PIC Microchip PIC Series cost as less as $5. MPLAB is a proprietary freeware integrated development environment for the development of embedded applications on PIC and dsPIC microcontrollers by Microchip Technology. MPLAB X IDE has cross-platform support for OS X and GNU/Linux. Another PIC microcontroller is 8051. AVR USB ISP Programmer is also available for 8051. They also cost around $5. AVR DUDE software is commonly used for the later. As Arduino is Open Source, there are cheaper ways like PaperDuino to build the board. Begining with too much complicated proprietary has no meaning today. You can avoid Arduino IDE and use other IDE, use C for Arduino. This Article Has Been Shared 8659 Times! Articles Related to Which Microcontrollers Can Be Programmed? In-circuit emulator or ICE is a tool for the software for an embedded system. The term is a misnomer, the softwares used for embedded system are analyzers. Is Cloud Hosting is Better Option for WordPress ? Is Cloud Hosting is Better Option for WordPress ? The right answer is – where and from whom you have heard it ? Secondly why you are thinking for an upgrade ? Wireless Sensor Network is a computer network of sensor nodes, in an infrastructure-based base stations or in an ad hoc network within their environment. Title: Which Microcontrollers Can Be Programmed? 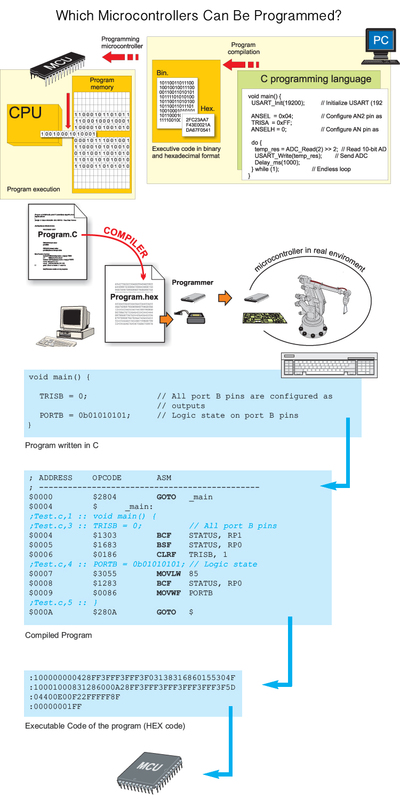 Cite this article as: Abhishek Ghosh, "Which Microcontrollers Can Be Programmed?," in The Customize Windows, June 10, 2016, April 21, 2019, https://thecustomizewindows.com/2016/06/which-microcontrollers-can-be-programmed/.